Although during her tenure in the White House as first lady Hillary enjoyed the benefit of 8 years of organic non-GMO food by virtue of her residency in the White House, 2016 candidate Clinton has been perhaps the most vocal proponent of GM food to yet enter the race. According to Global Research writer Stephen Lendman, nearly all the food produced for the Clinton White House was obtained from local growers and suppliers, GMO-free, pesticide-free, and with a preference for organic. That, preference, however, is not to be afforded the American people and the people of the Third World for whom Hillary is pushing every toxic GM variety known to man. Hillary’s Big-Agra ties go back quite a long ways. As far back as the 1980s, Hillary was working at high levels within the Rose Law Firm, a law firm that itself was tied to a number of scandals. Although not a scandal at the time, it is now important to note that the Rose Law Firm, at which Clinton was a partner, maintained Monsanto and Tyson Foods as clients. It has been speculated by many that Hillary’s ties to Monsanto and Tyson as a result of her career with Rose was yet another link in the chain pulling biotech giants together with the Bill Clinton administration in the 1990s. Indeed, Clinton’s disastrous presidency resulted in seeing a number of former-biotech giant employees being hired and appointed to the FDA, USDA, and other relevant regulatory posts within the US government. While being careful not to ascribe the blame of Bill Clinton’s either years of treachery to Hillary, it is nevertheless worthwhile to ask whether or not Hillary served as a middleman of sorts for major government-corporate collusion of this type. After all, when Clinton became US Secretary of State, she acted as Monsanto’s promoter both domestically and across the world, continuing a policy of GMO promotion that preceded and, apparently, continued even after she left the office. In December, 2010, WikiLeaks released sizable number of cables, about ten percent of which revealed that the US State Department was essentially acting as the marketing wing for biotech companies and “biotech” products across the world. The thousands of cables that were released spanned over 100 embassies and were, unfortunately, released just before Christmas. As a result, the story faded into the holiday madness. The U.S. State Department’s multifaceted efforts to promote the biotechnology industry overseas: The State Department targeted foreign reporters, hosted and coordinated pro-biotech conferences and public events and brought foreign opinion-makers to the United States on high-profile junkets to improve the image of agricultural biotechnology overseas and overcome widespread public opposition to GE crops and foods. The State Department’s coordinated campaign to promote biotech business interests: The State Department promoted not only pro-biotechnology policies but also the products of biotech companies. The strategy cables explicitly “protect the interests” of biotech exporters, “facilitate trade in agri-biotech products” and encourage the cultivation of GE crops in more countries, especially in the developing world. The State Department’s determined advocacy to press the developing world to adopt biotech crops: The diplomatic cables document a coordinated effort to lobby countries in the developing world to pass legislation and implement regulations favored by the biotech seed industry. This study examines the State Department lobbying campaigns in Kenya, Ghana and Nigeria to pass pro-biotech laws. The State Department’s efforts to force other nations to accept biotech crop and food imports:The State Department works with the U.S. Trade Representative to promote the export of biotech crops and to force nations that do not want these imports to accept U.S. biotech foods and crops. FWW also provides a few Hillary quotes demonstrating the State Department’s push for GM crops worldwide such as her statements linking GMOs to solving “climate change” and world hunger. “We believe that biotechnology has a critical role to play in increasing agricultural productivity, particularly in light of climate change,” Clinton is quoted as stating. “[W]e want to shift our focus to agricultural sustainability, focusing on the small producers, helping them understand the value of GMOs — genetically modified organisms,” she also said while serving as Secretary of State. It should be mentioned that, as Secretary of State, Hillary also helped promote the USAID –funded program “Feed the Future,” an initiative that promotes and introduces Round-up Ready®products all over the world. How is Hillary personally involved in supporting big agriculture? The Clinton Global Initiative (CGI), which gathers leaders to solve the world’s problems, promotes Monsanto, the maker of RoundUp® and RoundUp Ready® seeds. Hugh Grant, Monsanto’s Chairman and CEO spoke at the Clinton Global Initiative conference in September, 2014. Ms. Clinton’s top campaign advisor, Jerry Crawford, was a lobbyist for Monsanto for years and is now the political pro for her Super PAC, “Ready for Hillary.” Clinton spoke in favor of the government’s Feed the Future (FtF) program, a USAID funded, corporate-partnered program that brings RoundUp Ready® technology to the most vulnerable populations of the world. Monsanto and Dow Chemical support Hillary and Bill’s ‘Clinton Foundation’ with generous donations. It’s also highly unlikely for Hillary Clinton to stand up against her benefactors, saying she favors a review of RoundUp, 2,4-D, and the even more toxic poisons used by farmers worldwide when she has friends in the industry telling her that they will “feed the world” someday with their agricultural methods. Monsanto gave the Clinton Foundation from half a million to one million dollars – Ag giant Dow Chemical from one to five million dollars, according to Bill, Hillary & Chelsea Clinton Foundation disclosures. Numerous other corporate giants contributed large sums. Expect them donating handsomely to Hillary’s presidential campaign. Candidate Clinton is no better than Secretary, Senator, or First Lady Clinton. In fact, she may even be worse considering that, even when faced with election woes stemming from her support of GM foods, she is still stalwart and vocal in her support of them, going so far as to openly raise funds from Big-Agra donors and attend Big-Agra lobbying initiatives. Candidate Clinton in 2008 was bad enough. Back then, Clinton was supported by a group called Rural Americans For Hillary, an organization closely connected to the lobbying firm of Monsanto. Linn Cohen-Cole suggests that it was Hillary Clinton who was the brainchild (at Penn’s instruction) to appoint notorious Monsanto henchman Michael Taylor to the position of head of the FDA, a man whom Bill Clinton had once appointed to the FDA and USDA. In 2015, when Hillary began assembling her 2016 campaign team, she tapped Monsanto lobbyist Jerry Crawford to act as an “adviser” to the Ready For Hillary Super PAC. Crawford was also co-chair of her 2008 campaign. Before joining Clinton’s campaign in 2008, Crawford served in a variety of high-profile political roles. In addition to a variety of local positions, he served as the Iowa chair for the presidential campaigns of Mike Dukakis, Bill Clinton, Al Gore, John Kerry—each one the more conservative candidates in their Democratic presidential primaries. So it was a natural fit for Crawford to sign up for the Hillary campaign. But after Clinton’s 2008 loss, Crawford spent his days at Crawford Muaro, his law and lobbying firm. While there, he represented a variety of corporate clients, including Kraft and Altria (the parent company of Philip Morris USA). He also served as a lawyer for Jack DeCoster, a factory farm tycoon who infamously supplied eggs that led to a salmonella outbreak. His most prominent client, however, was Monsanto. Stephen Lendman also points out that Crawford was involved in fighting small farmers through the court system on behalf of Big-Agra. Hillary’s long history with Big Agra should have foretold the glowing praise she would leap upon GM crops and big Biotech companies at the world’s largest trade organization of biotechnology firms in San Diego in late June 2014. “I stand in favor of using seeds and products that have a proven track record,” Hillary said. She also added that pro-GMO advocates need to continue to hammer at those more skeptical of frankenfoods. “There is a big gap between what the facts are, and what the perceptions are,” she said, echoing a typical Big Agra talking point designed to be appealing to trendies and hipsters. Clinton also gave some marketing advice to the participants regarding how they present GM food to the public. “‘Genetically modified’ sounds Frankensteinish. ‘Drought resistance’ sounds really – something you want. So how do you create a different vocabulary to talk about what it is you’re trying to help people do,” she said. We talk about drought-resistant seeds, and I’ve promoted them all over Africa. By definition, they have been engineered to be drought-resistant, I mean that’s the beauty of them. Maybe somebody can get their harvest done and not starve, and maybe there’s some left over to sell. And yet I’ve been involved in a lot of the political debates in other countries about whether or not to accept certain kinds of seeds. We created a program called Feed the Future, which is trying to help the farmers be educated enough to know that drought-resistant seeds, for example, are not going to hurt them. And this is painstaking work, doesn’t get solved overnight. You have to be working at the top with the departments of agriculture, with finance ministries, with prime ministers and presidents’ offices, and you have to be working from the bottom up. I don’t see the short cut for it. I don’t want to see biotech companies or pharma companies moving out of our country simply because of some perceived tax disadvantage and potential tax advantage somewhere else. Clinton’s 2016 race has, as mentioned, gotten off to a great start thanks to donations from Monsanto lobbyists in the form of bundlers – fundraisers who are able to skirt election donation laws by convincing their contacts and associates to donate to a political candidate. Jerry Crawford, the famed Iowa-based Monsanto lobbyist, has already raised $35,000 for Clinton. Brandon Turbeville – article archive here – is an author out of Florence, South Carolina. He is the author of six books, Codex Alimentarius — The End of Health Freedom, 7 Real Conspiracies, Five Sense Solutions and Dispatches From a Dissident, volume 1and volume 2, The Road to Damascus: The Anglo-American Assault on Syria, and The Difference it Makes: 36 Reasons Why Hillary Clinton Should Never Be President. Turbeville has published over 600 articles dealing on a wide variety of subjects including health, economics, government corruption, and civil liberties. Brandon Turbeville’s podcast Truth on The Tracks can be found every Monday night 9 pm EST at UCYTV. He is available for radio and TV interviews. Please contact activistpost (at) gmail.com. This article (Hillary Clinton: The Bride Of Frankenfood) can be republished under this share-alike Creative Commons license with attribution to Brandon Turbeville, the article link and Natural Blaze.com. Lendman, Stephen. “Hillary Clinton Endorses GMOS. White House Meals Are Organic.” Global Research (Centre For Research On Globalization). May 25, 2015.http://www.globalresearch.ca/hillary-clinton-endorses-gmos-white-house-meals-are-organic/5451481 Accessed on September 1, 2015. Gerth, Jeff; Van Natta, Jr., Don (2007). Her Way: The Hopes and Ambitions of Hillary Rodham Clinton. New York: Little, Brown and Company. ISBN 0-316-01742-6. p. 60. Hatfield, Leslie. “New Analysis Of Wikileaks Shows State Department’s Promotion Of Monsanto’s GMOs Abroad.” Huffington Post. July 20, 2013. http://www.huffingtonpost.com/leslie-hatfield/new-analysis-of-wikileaks_b_3306842.html Accessed on September 1, 2015. “Biotech Ambassadors: How The U.S. State Department Promotes The Seed Industry’s Global Agenda.” Food and Water Watch. May, 2013.http://documents.foodandwaterwatch.org/doc/Biotech_Report_US.pdf Accessed on September 1, 2015. U.S. Department of State (U.S. DoS). “FY 2008 biotechnology outreach strategy and department resources.” Cable No. 07STATE160639. November 27, 2007. Biotech Ambassadors: How The U.S. State Department Promotes The Seed Industry’s Global Agenda.” Food and Water Watch. May, 2013.http://documents.foodandwaterwatch.org/doc/Biotech_Report_US.pdf Accessed on September 1, 2015. U.S. Senate Appropriations Committee. Hearing on the President’s FY2009 War Supplemental Request. April 30, 2009. Lauritsen, Sharon Bomer, Executive Vice President of Food and Agriculture at BIO. Letter to Professeur De Schutter, the UN Special Rapporteur on the Right to Food. May 29, 2009 at 14. Jilani, Zaid. “Hillary’s Pick For Her Political Fixer In Iowa Is A Classic Illustration Of America’s Political Corporate Insider Problem.” Alter Net. March 9, 2015. http://www.alternet.org/news-amp-politics/hillarys-pick-her-political-fixer-iowa-classic-illustration-americas-political Accessed on September 2, 2015. Ishii-Eiteman, Marcia. “U.S. Looks To Monsanto To Feed The World.” Ground Truth. February 2, 2011. http://www.panna.org/blog/us-looks-monsanto-feed-world Accessed on September 2, 2015. Frankel, Judy. “Hillary Vs. Bernie On Frankenfood.” Huffington Post. June 23, 2015.http://www.huffingtonpost.com/judy-frankel/hillary-vs-bernie-on-fran_b_7638846.htmlAccessed on September 2, 2015. “Hillary’s Agribusiness Ties Give Rise To Nickname In Iowa: ‘Bride Of Frankenfood.” Washington Times. May 17, 2015. http://www.washingtontimes.com/news/2015/may/17/hillary-clinton-gmo-support-monsanto-ties-spark-ba/?page=1 Accessed on September 2, 2015. Parker, Jennifer. “Yee-Haw.” ABC News. December 17, 2007.http://blogs.abcnews.com/politicalpunch/2007/10/yee-haw.html Accessed on September 2, 2015. Sarich, Christina. 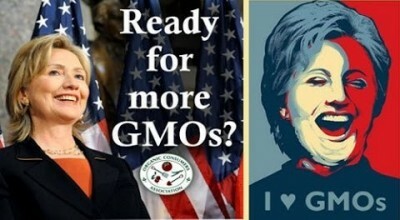 “’Bride Of Frankenfood’ Hillary Clinton’s GMO Ties Spark Backlash In Iowa.” Natural Society. May 28, 2015. http://naturalsociety.com/bride-of-frankenfood-hillary-clintons-gmo-ties-spark-backlash-in-iowa/ Accessed on September 2, 2015. Johnson, Luke. “Mark Penn All But Out For Potential Hillary Clinton 2016 Run.” Huffington Post. May 20, 2013. http://www.huffingtonpost.com/2013/05/20/mark-penn-hillary-clinton_n_3305808.html Accessed on September 2, 2015. Scarehuman. “Mark Penn, Taking A Break From Monsanto To Run Hillary Clinton’s Campaign.” Daily Kos. March 17, 2008. http://www.dailykos.com/story/2008/03/17/458386/-Mark-Penn-taking-a-break-from-Monsanto-to-run-Hillary-Clinton-s-campaign Accessed on September 2, 2015. Cohen-Cole, Linn. “Monsanto And Hillary Clinton’s Redemptive First Act As Secretary Of State.” OpEdNews. February 9, 2009. http://www.opednews.com/articles/Monsanto-and-Hillary-Clint-by-Linn-Cohen-Cole-090209-290.html Accessed on September 2, 2015. Terris, Ben. “Jerry Crawford Has Two Goals: Delivering Iowa For Hillary Clinton And Winning The Kentucky Derby.” Washington Post. March 2, 2015.https://www.washingtonpost.com/lifestyle/style/hillary-clintons-iowa-horse-whisperer-jerry-crawford-aims-for-caucus-kentucky-derby/2015/03/02/9c93b638-be23-11e4-bdfa-b8e8f594e6ee_story.html Accessed on September 2, 2015. “Jerry Crawford.” Crawford Mauro Law Firm.” Crawford bio.http://www.crawfordlawfirm.com/attorneys/view.cfm?id=20 Accessed on September 2, 2015. Lim, XiaoZhi. “Video: Hillary Clinton Endorses GMOs, Solution-focused Crop Biotechnology.” Genetic Literacy Project. July 3, 2014. http://www.geneticliteracyproject.org/2014/07/03/video-hilary-clinton-endorses-gmos-solution-focused-crop-biotechnology/ Accessed on September 2, 2015. Ocean, Max. “Hillary Clinton Goes To Bat For GMOs At Biotech Conference.” Common Dreams. July 3, 2014. http://www.commondreams.org/news/2014/07/03/hillary-clinton-goes-bat-gmos-biotech-conference Accessed on September 2, 2015. “Hillary Clinton At BIO Convention 2014.” Youtube. Posted by Ken Stone. June 27, 2014. Hillary Rodham Clinton, answering questions as if a presidential contender, speaks to thousands at the BIO International Convention on June 25, 2014, at the San Diego Convention Center. She was interviewed by Jim Greenwood, president and CEO of the Biotechnology Industry Organization.https://www.youtube.com/watch?v=Hypwb_SYaAc&feature=youtu.be Accessed on September 2, 2015. Brody, Ben. “Lobbyists For Monsanto, ExxonMobil Raise Money For Hillary Clinton.” Bloomberg, July 17, 2015. http://www.bloomberg.com/politics/articles/2015-07-17/lobbyists-for-monsanto-exxon-mobile-raise-money-for-hillary-clinton Accessed on September 2, 2015.